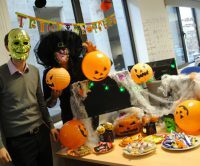 Halloween saw things take a spooky twist in the London office. Overnight, cobwebs and pumpkins appeared along the desks, whilst the team appeared to have taken on a more sinister appearance. Although their appearances may have changed, the team are still seeking teachers, LSAs, Teaching Assistants and SEN specialists for roles across London. If interested, please contact one of the team on 020 3394 2620. Please also note that the deadline for the Christmas Card Competition has been extended until the 9th November, so get your entries in soon. Do not forget that Movember starts tomorrow: for updates from the team, check out our Facebook and Twitter pages.